BPM information can be stored in the Media Library for an Item. BPM information can be added to the Media Library and viewed in the Album/Item Information dialog box. It is also displayed in all list areas, including the Media Library, Playlist, Work Area, History, and Media Library Search windows. Note: The BPM Counter is a handy tool that enables you to manually work out the Beat Per Minute count for a song. See below for details. Ots Studio can automatically calculate the BPM of Ots files. See the Ots Studio documentation for more information. To find the BPM Counter double-click on a item, in the Album/Item Information dialog box and click the Tap... button. Place the item you wish to set the BPM for into a deck and press play. 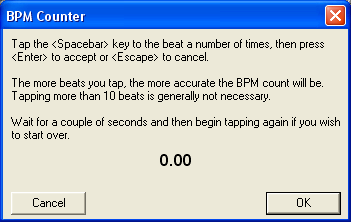 Begin tapping the space bar in time with the music, the more beats you tap the more accurate the BPM count will be. Once you are happy with the result press Enter, or Click the OK button. The BPM count will be added to the BPM field in the Media Library. Right-click on the Item you wish to remove the BPM Information from. Select the Other -> BPM -> Set to "Unset" option. Tip: Set all items to "Unset" to force OtsAV to display the BPM values contained within your Ots files. Right-click on the Item you wish to set as a "Non-Music" Item. Select the Other -> BPM -> Set to "Non-Music" option.